During this month we had the opportunity to teach the concept of diversity, acceptance and respect. Understanding each person is unique and recognizing our individual differences. We explore these differences in a safe, positive and nurturing environment conducive to growth. In teaching differences and similarities in people and the importance of love and acceptance of other cultures, understanding each other and embracing the rich dimension of diversity contained within each individual. 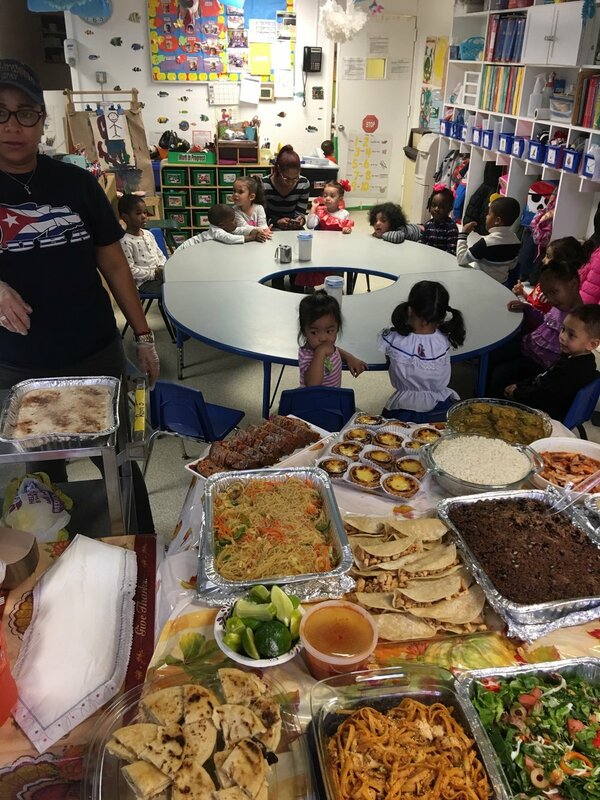 Our classroom has a rich mix of diversity: Cuba, Guyana, Trinidad, El Salvador, Puerto Rico, Haiti and Dominican Republic, Mexico, Portugal, Philippines and United States. To introduce the theme we read diverse books to our students and had friendly open discussions and identifying the different skin tones, and types of hair among ourselves . We provided each child with a paper person shape and instruction for parent/s and child to decorate using fabric, paper and or crayons to allow them to choose their skin color representing their culture for our classroom display, showing we are all people from different parts of the world and friends. As a small group activity we provided the children with paper, crayons, beans and glue to create themselves to show differences in people, shapes, sizes and talent. During large group activity our Music teacher Ms. Betsy played a number of multicultural music from around the world, she introduced and allowed each child to play different instruments; the children were elated to play the different instruments they enjoyed singing and dancing along to the music, it was an enjoyable moment. We ended our lesson with a multicultural celebration with lots of food from our countries and dressed to represent each country, it was lots of fun having the parents, children and teachers dining together sharing and enjoying each other company.